A veneer is a thin layer of restorative material placed over a tooth surface, either to improve the aesthetics of a tooth, or to protect a damaged tooth surface. There are two main types of material used to fabricate a veneer, composite resin and dental porcelain. A composite veneer may be directly placed (built-up in the mouth), or indirectly fabricated in a dental laboratory, and later bonded to the tooth. In contrast, a porcelain veneer may only be indirectly fabricated. If you have chips in your teeth, cracks, discoloration, flaws in shape, and inconsistencies in spacing, then veneers could work to improve these imperfections, leaving you with straighter and whiter teeth that are chip, crack, and stain-free! 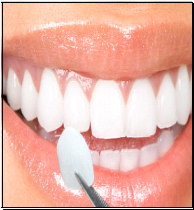 The teeth whitening process works by introducing a bleaching or oxidizing agent to the enamel of stained teeth. The enamel is the substance at the top most layer of the tooth. This bleaching agent will penetrate the enamel and bleach the stains within the enamel. Patients will be provided with an at-home bleaching kit and will need to use the peroxide-containing whiteners for a period of time as determined at the time of consultation. The whitening gel is placed in a plastic mouth tray and worn for one hour each time. Typically after one week of one-hour long whitening treatment, patients notice improvement in the aesthetics of their teeth. Some patients report temporary teeth sensitivity during and after whitening treatment. The sensitivity usually dissipates a few days after whitening treatment is completed. Restore health and vitality to your smile. Our cosmetic dentistry treatments can correct everything from minor flaws to severe tooth discoloration, gapped teeth, even missing teeth. We can help you obtain a beautiful, lasting look – so you can smile with confidence. If you want to find out how our cosmetic dentists can improve your smile, contact us today. Find out what we can do for you.